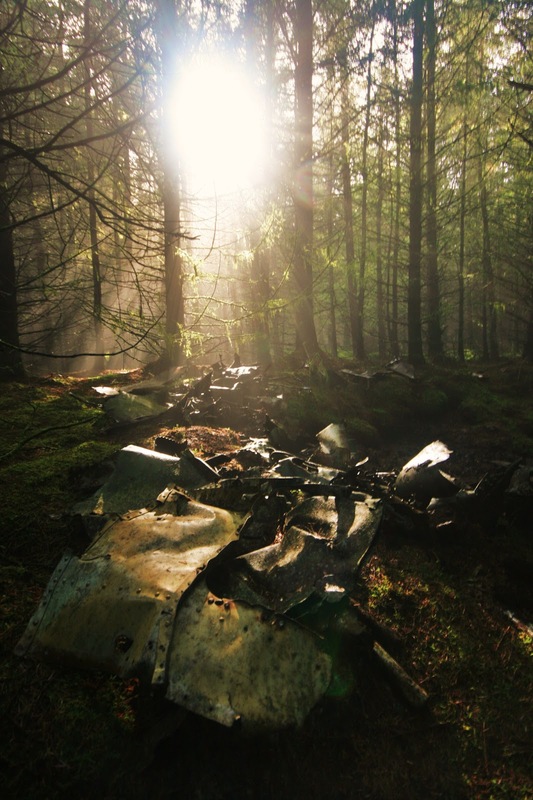 An estimated 10,000 military aircraft crashed in Britain during WW2 , the crashes did not stop there though and continue still . 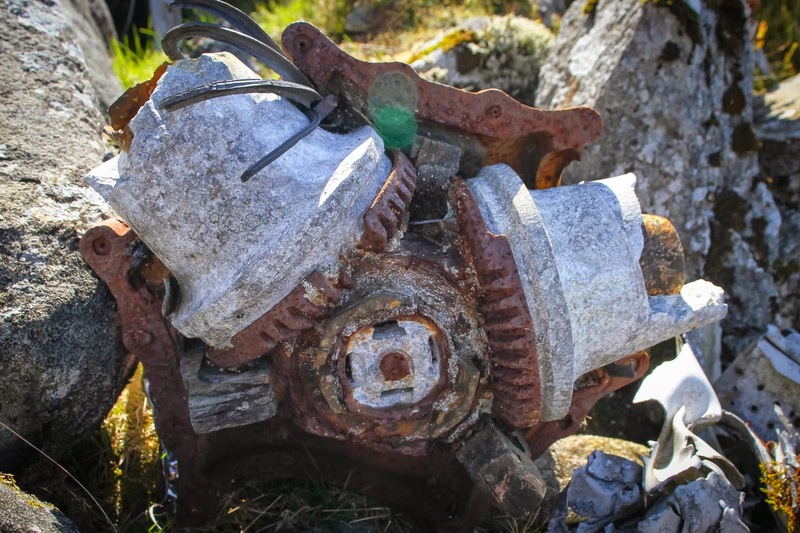 This Blog , in early stages of development , shows a variety of details regarding the crash sites and contain photographs that relate the crash sites and wreckage to thier enviroment . On the 12th October 1956 at 1910 hours this aircraft , the De Havilland Vampire VZ874 took off from RAF Valley on nearby Anglesey. The pilot, a member of the Fleet air Arm, Sub-Lt R. Davies was in training on Vampires and had just begun his night flying training having already flown a total of 110 hours in the type. His brief that night was to fly locally and do circuits (landings and takeoffs at the airfield). 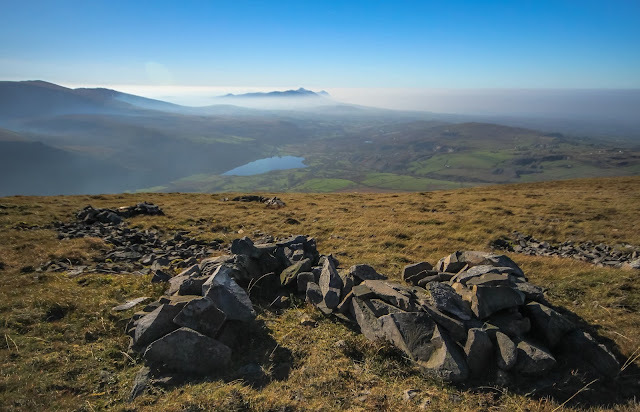 Flying by instruments alone and only ten minutes after taking off the aircraft crashed into the West of the summit of Mynydd Mawr in Snowdonia. Unfortunately Sub-Lt Davies was killed in the crash. 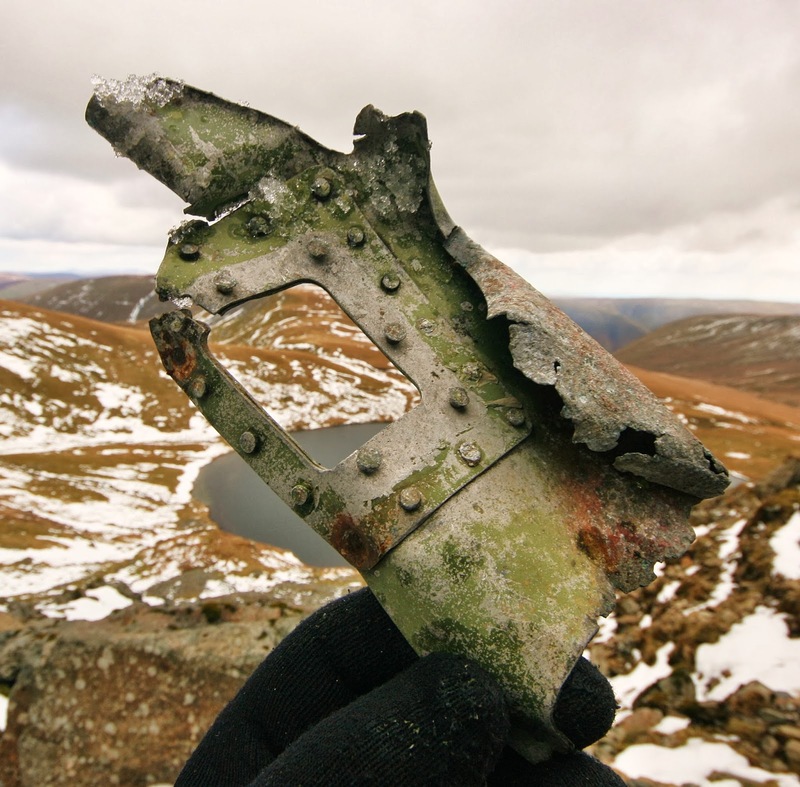 The aircraft is said to have exploded on impact many parts of the aircraft continued across the summit and fell into the the cwm below on the East face of the summit. The alleged impact point is now marked by the aircraft's letters in the scree a V and a Z .We found nothing here now...but possibly didnt look hard enough because photographs of small fragments can be seen on the internet. On descending into Cwm Planwydd we had more success finding engine parts and aircraft spars. The Aircraft a D.H. 100 F.B.Mk 5 was built at Broughton as a batch order of 63 machines. 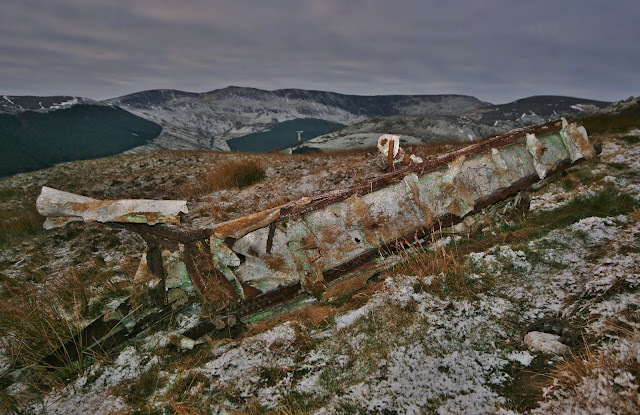 On the 1st November 1944 this Mosquito Aircraft crashed into Mynydd Mawr in North Wales. Flying out of RAF Cranfield on a night navigation exercise the crew became misplaced and crashed into the hillside at a col below the summit. The aircraft broke up and was scattered over a wide area, the bulk of it coming to rest and burning out. This location can still be seen. a liberal scattering of brass screws from the wooden aircrafts structure and molten alloy from the engines cover the site. Further down the hill a substantial section of undercarriage remains still with timber extant attached. 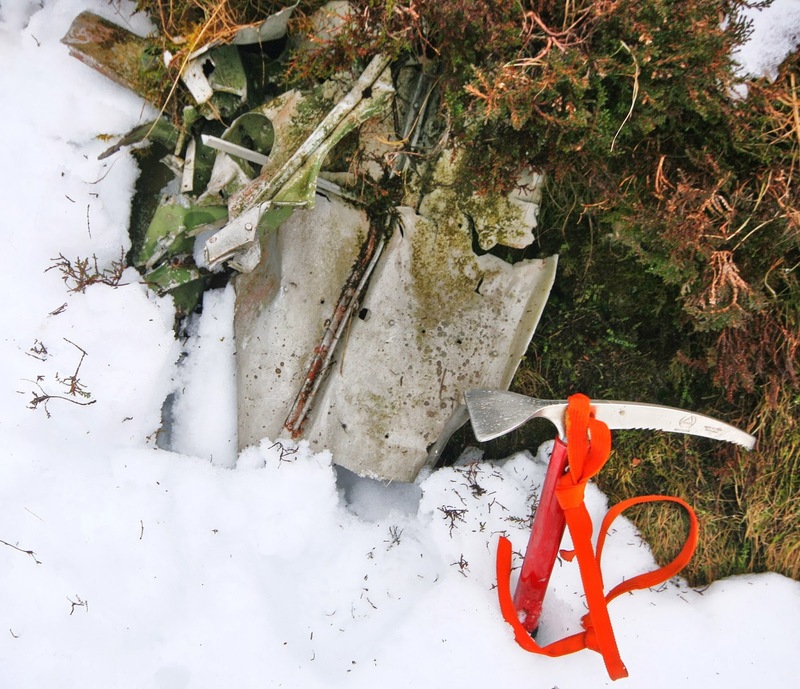 Other smaller pieces of wreckage can be found with a careful search of the area. Our visit took place on the 71st anniversary of the crash. 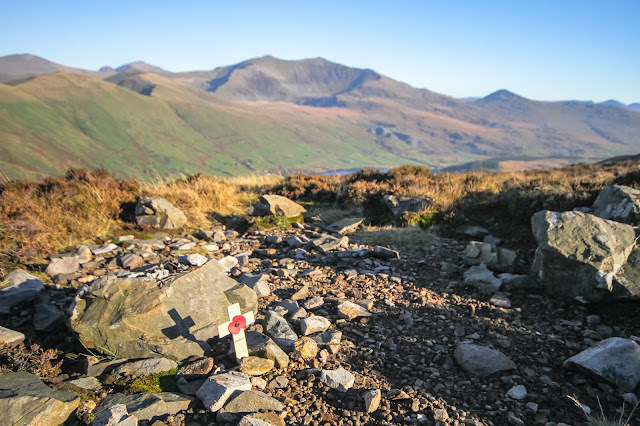 On the 6th February 1945 flying out of RAF North Luffenham , Lancaster NE132 crashed into the flank of Rhinog Fawr in North Wales whilst on a cross country training flight . The aircraft apparently entered a Cumulo-Nimbus cloud and it is suspected that ice formed upon the fuselage and wings causing a catastrophic airframe failure . The aircraft broke up in flight plummeting down into the mountainside . Fatigue may have played its part for the aircraft had completed many missions over enemy territory before being 'retired' into No. 1653 HCU for use in training . F/O;s Evans and Moon were Australian and members of the RAAF. Sgt Neilsen was from Chile . It is known that two of the men managed to bale out but were too low for their parachutes to open properly . The bodies of two other crewmen, F/O Evans and Sgt Gash have never been found . This makes the main impact point a war grave . Their names are on the Runnymede Memorial . F/O Evans on panel 283 and Sgt Gash on panel 272 . 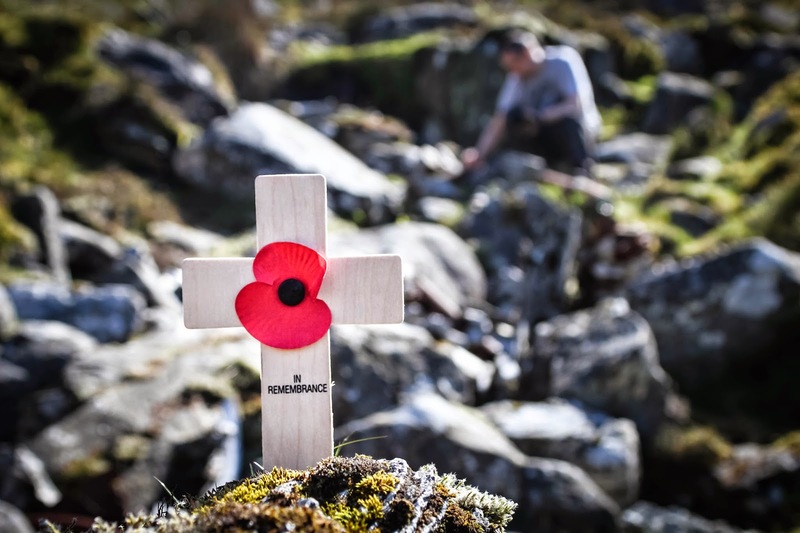 Whilst of little comfort to the families of the men it can at least be said that they are in one of the most serenely beautiful areas of Snowdonia . This is a picture I took of a card left at the memorial . A thoughtful addition by someone . The wreckage with stamps upon it on the right is the same part pictured below with myself holding it (Thanks Ian for the pic) . The R3 means that it was a Manchester built aircraft part . the others are part numbers . 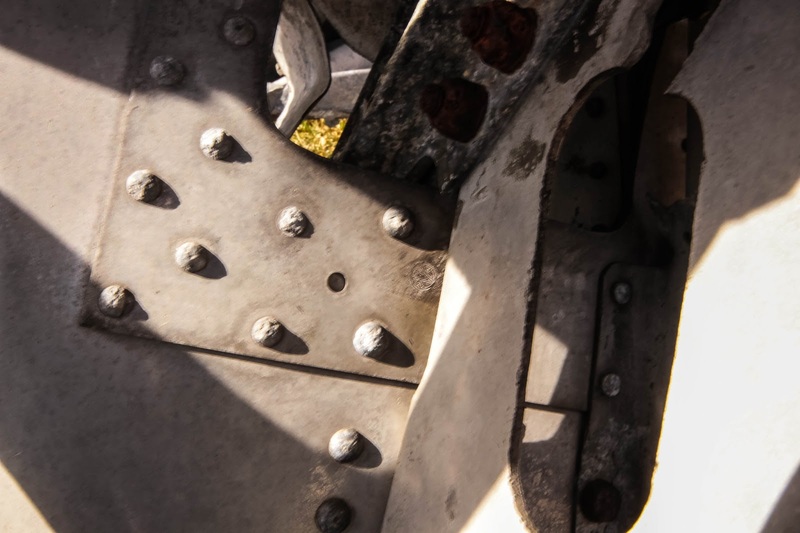 there is some strong evidence to suggest that the part in question was a part of the regular crew entrance to the aircraft towards the rear of the fuselage . more than that , it has as part of the chunk the ridged threshold with a section of exterior panel and interior strengthening ribs and plates . Its quite nice to be able to put a name to a part of the shattered fragments . On the 10th of February 1945 this aircraft flying out of RAF Pershore to test fuel consumption rates crashed into the rockface of Aran Fawddwy presumably they had become lost whilst flying through some bad weather . They were part of No1 Ferry Unit . The two man crew were killed . The gulley is very steep and has a 'bad step' not far down . 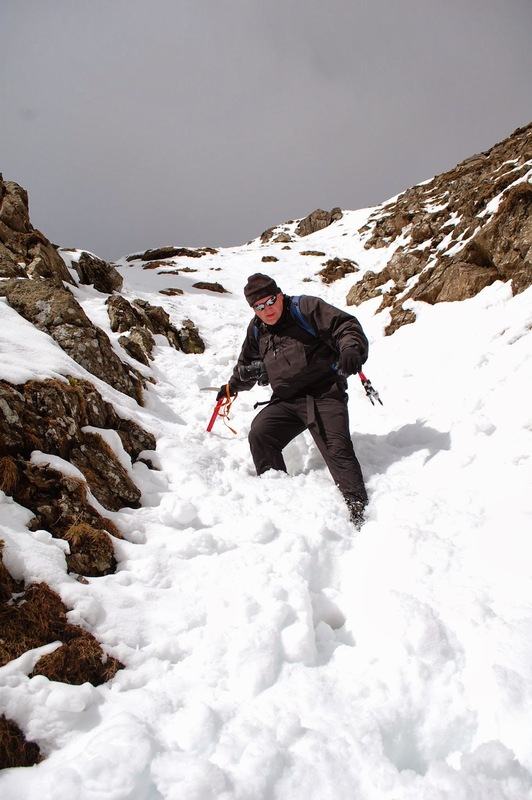 We descended in fairly deep snow which made the going easier at least at the top . luckily it had recently avalanched and seemed as safe as something like this can be , with broken snow till it became to thin to matter . The bad step was a pig and covered in ice if youre gonna go down be sure of your abilities ! Its probaly easier to go up in summer! It was though great fun ....less fun was climbing back up and over the mountain to get back to the car ...a basic error of thought ....Aran Fawddwy is a big mountain and we did it twice the hard way ! This is the highest bit of wreckage we found , its quite large , there is probaly more higher but the snow cover prevented us from seeing it . That is my ice axe giving a bit of scale . Looking down hill at the foot of the gulley , a peice of undercarriage is eveident in the foreground . Ian can be seen looking back up giving scale to the scene . The snow is definately thinning out here . there are largish chunks all the way down to the water . Although we never did find one of the engines that was reportedly at the waters edge . 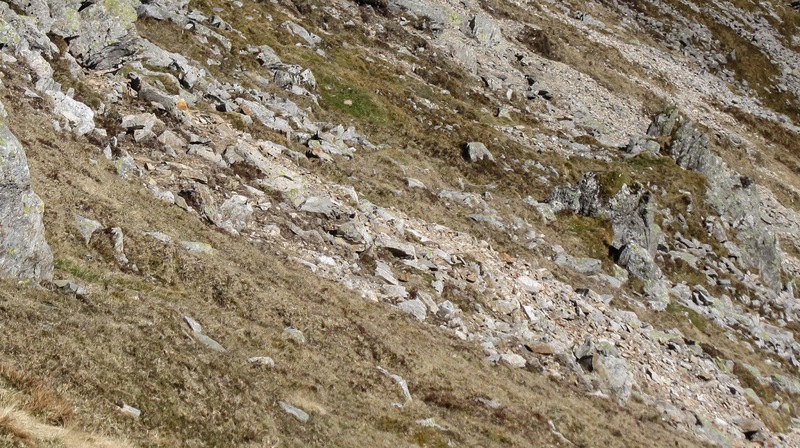 Thats me , rolling down the gulley , nimble like a fox ! It looks sunny but it was just a brief respite from the snow showers that came and went all day . Its amazing where this hobby can take you . On the 3rd February 1944 this aircraft from 848 Squadron crashed into Trum y Fawnog during a snowstorm . The aircraft apparently shed a wing before crashing into the ground at high speed , Doylerush says the aircraft was armed with a torpedo. It was on a flight from Gosport to HMS Robin in the Orkney Islands stopping at Machrihanish on the way . It is also said that there were Four people killed on the flight but some sources only say three were killed . Whatever the truth is ,only three names are at present known . If any one can bring light to the subject please feel free to add comment with the facts . 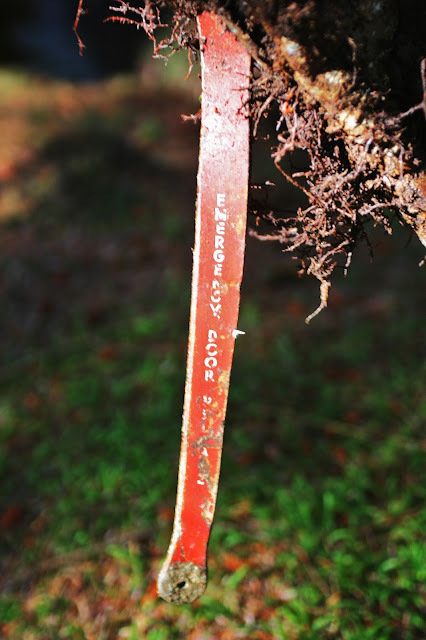 The site showed signs that it had been recently dugby someone after loot and aviation treasures . The very fact that this was a violent aircrash and there is a distinct possibility of a missing crewmember/passenger this is near to being grave robbing . Pilot Appleby was from New Zealand , he died in the cold a long long way from home . we found poking out of the ground the emergency door lever in part open position still attached to part of the cockpit frame . It occured to me that one of these mens last actions on earth may have been to attempt to escape the aircraft using this handle . 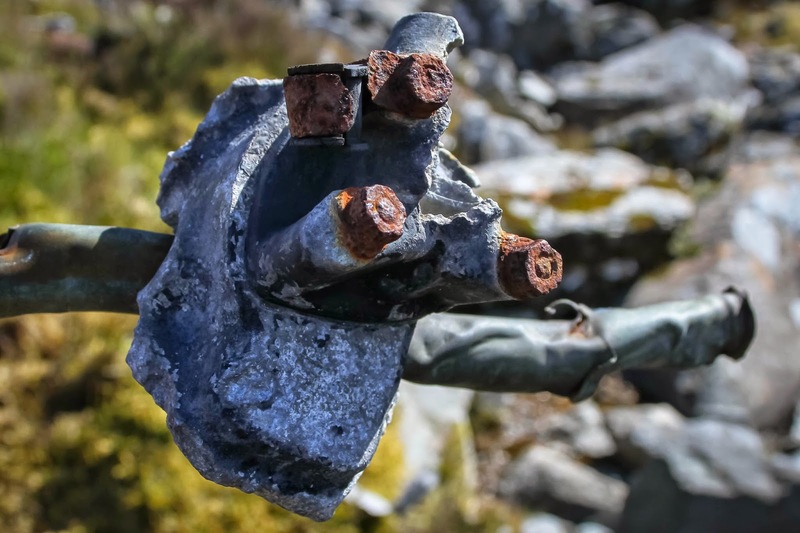 See below for a clear shot of the writing on the handle . .
On the 18th August 1943 Ventura AE688 of the RAAF 464 Squadron crashed into Carnedd Daffydd in Snowdonia ,North Wales. 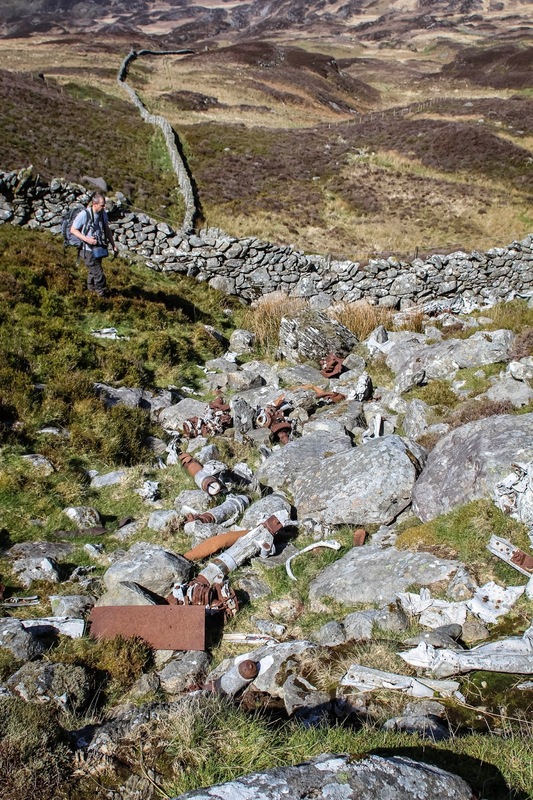 of crash was noted by an army traing unit down by Llyn Ogwen (perhaps utilising the pillbox) as 22.38. All the crew were killed . 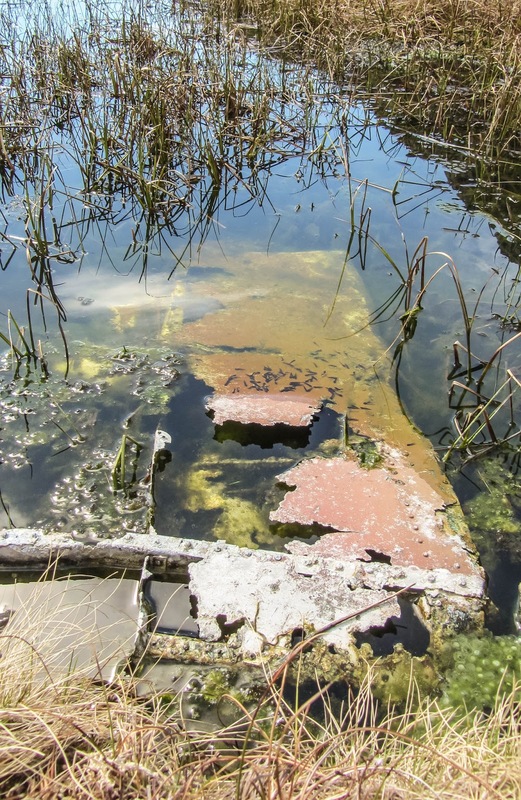 Pictured in the main shot is a wing section of the Ventura , beyond that is an alleged pool of Anson wreckage but some of which clearly shows the Lockheed manufacturers stamp . Above can be seen the impact point . 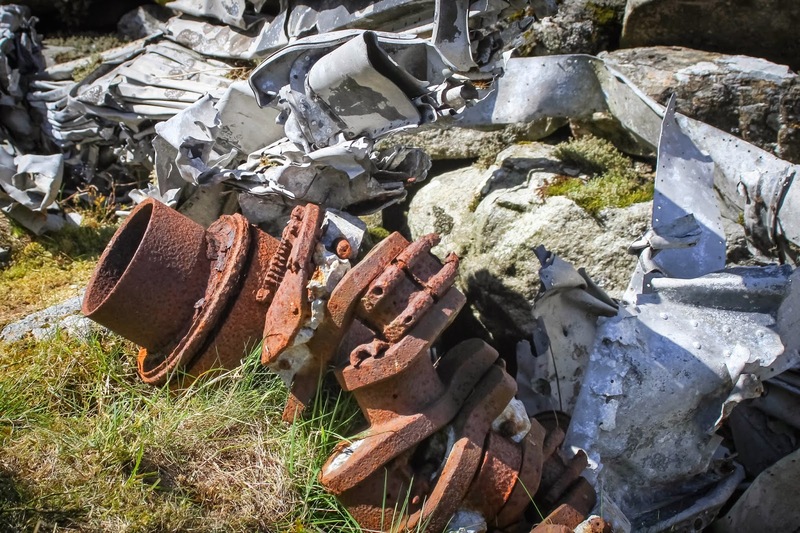 to the left and below are pieces of wreckage some of which carry manufacturers stamps proving they are from this aircraft . BJ697 took off from Chipping Warden on a night- time cross-country training exercise on the 26th September 1942 . Off route presumably lost the aircraft descended through cloud crashing near to Fan Hir on Black Mountain in the Brecon Beacons . The crew of four all initially survived the impact , one unharmed three badly injured . Subsequently , three days later, the pilot died of his injuries. Flight Sergeant Bird is buried in St Leonard's churchyard, Cliddesden, Hampshire. I have found mention of a Sgt Troubridge who is alleged to have been in the crew and was an injured survivor in the crash but have been unable to substantiate this claim at the present time . On the 9th October 1953 flying out of RAF Pembrey this De Havilland Vampire aircraft was flying as the lead aircraft of a pair of Vampires . Descending through cloud the pilot must have failed to see the ground approaching and hit the western slope of Fan Fir on the Black Mountains in the Brecon Beacons National Park. The pilot of the second aircraft did see the ground and managed to avoid collision with it , a fortunate escape for him. A huge amount of this aircraft remains at the site . Someone as collected the majority of it and layed it out into the rough shape of a Vampire aircraft . These shots show the location of the main wreckage pool amidst the mountains! On the 20th November 1944 this Wellington bomber crashed on Carrog Goch in the Brecon Beacons, Wales. Flying out of RAF Wellebourne for a nightime navigation exercise. Shortly before 20.50 hrs the crew sent a radio message asking permission to go below cloud as they were having trouble with the starboard engine. They descended and hit the hill. All six crewman were killed. Probaly this parks best preserved crash site, it is often visited by enthusiasts and casual walkers alike . Despite feeling in the middle of nowhere once there, it is in fact quite easy to get to without too much hardship..
An unusual last journey for this aircraft and crew began in Morrisfield, Florida before continuing on its exotic way through Trinidad ,Brazil , Dakar, Marrakech,before finally landing at RAF St. Mawgan in Cornwall. The last section of the journey was to Burtonwood in Lancashire . They set off from St. Mawgan at 12.38 for the final short leg on the 1st. February 1945 . They were destined to never arrive at Burtonwood . Low cloud and high winds resulted in them going off course and flying at just over 3000 feet they decided to either land not realising they were off course or to attempt to get a fix by dropping beneath the clouds . Perhaps unaware of the dangers of flying in the UK in cloud they descended straight into the near summit of Y Garn in the Snowdonia mountain range Wales. The aircraft broke in two on impact the front section hurtling over the ridge and down into Cwm Cywion . 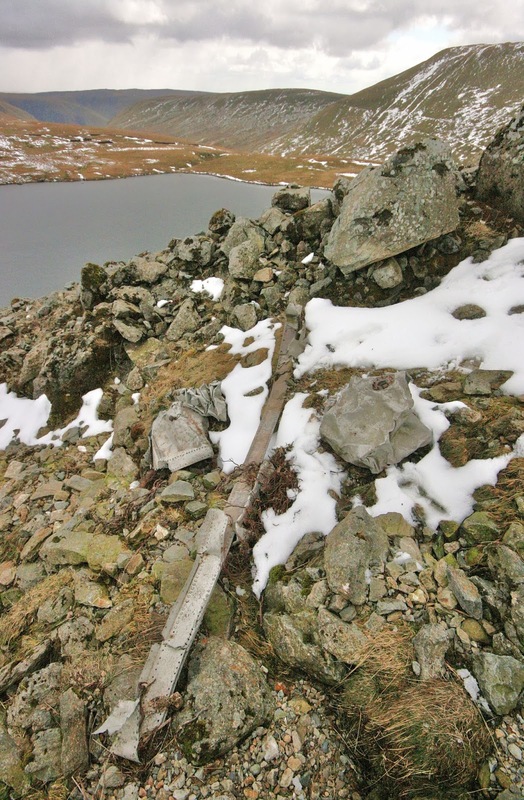 One crew member lay dead near the summit the other four remained in the wreckage that went down into the Cwm . Eyewitness accounts of the scene state that they could not have survived the intial impact . 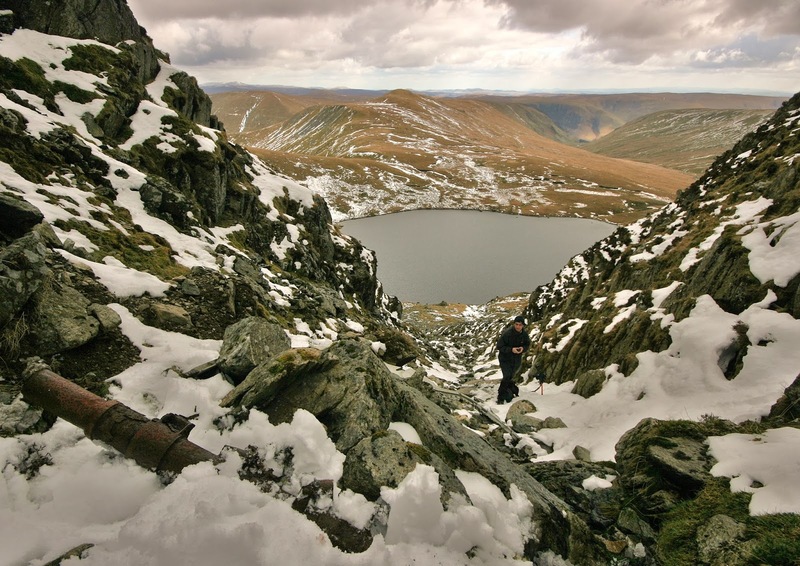 It was another two days before the bodies were recovered from the snow covered mountain. 1stLt. Nolen B. Sowell Nav. Cpl. Jack D. Arnold Rad. Op. Cpl. Rudolph M . Aguirre Eng. All were from States across America . 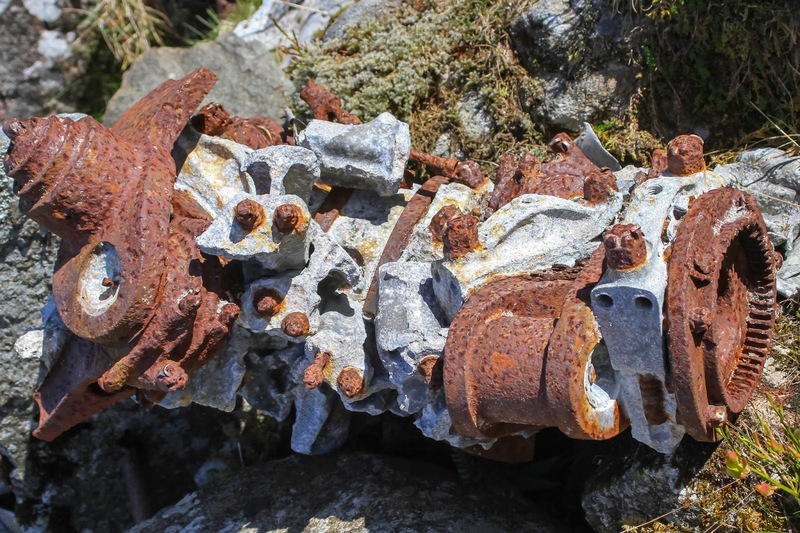 Up to the 60's and 70's much wreckage remained but since then 'enthusiasts ' have removed it .....very little remains now at the summit , we found small pieces of alloy from an engine cylinder casing and a few shards of glass there. 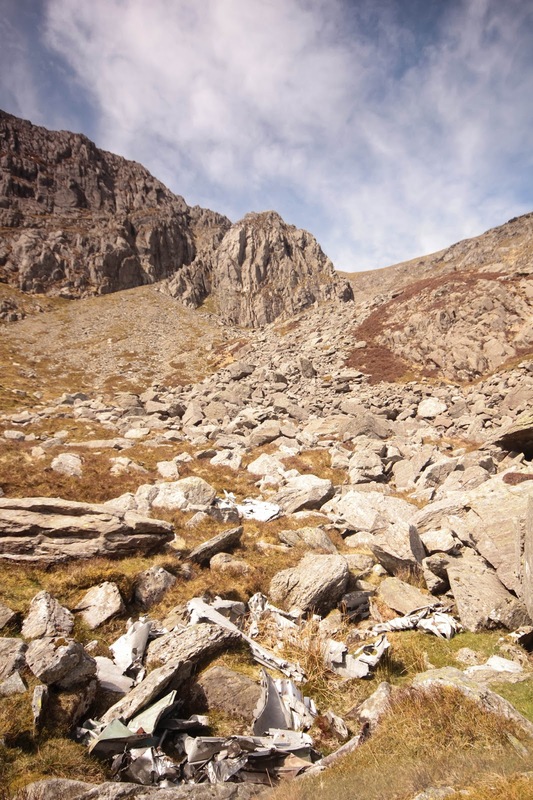 More is to be found in the Cwm and on the scree but even then it amounts to very little . A tragic event , the crewmen never really had a chance to aclimatise themselves to the weather over the UK which claimed a very many lives during the war . The fragments of aircraft cover quite a large area of mountainside , we scrambled up the scree from the foot to the top looking at what we found on the way . 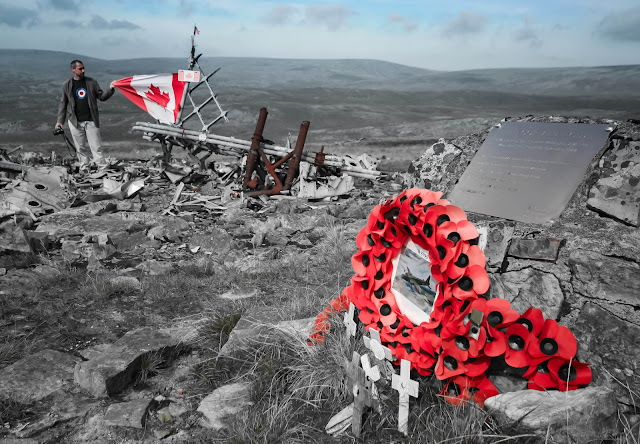 On the 9th of December 1957 this Canberra B2 whilst working on Radar trails, with the radar station on the near-by mountain 'Drum', crashed at high speed into a mountain ridge just below the summit of Carnedd Llwelwyn . 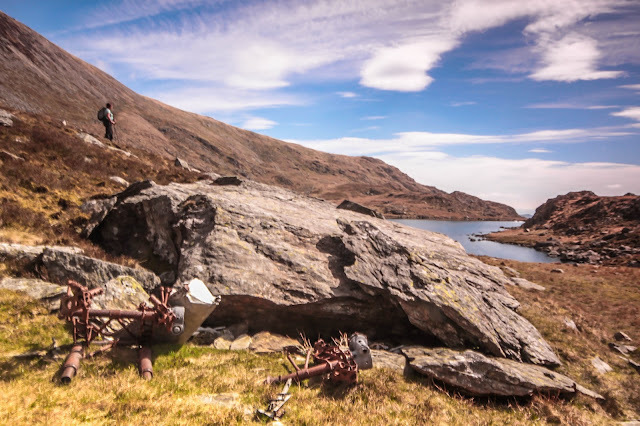 Hitting the North-West facing slope the aircraft travelling at high speed continued over the ridge and disintegrated over and around Ffynnon Llyffant , the highest lake in Wales. 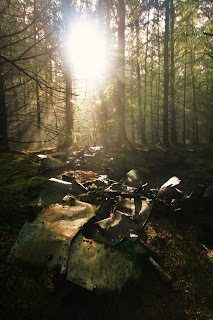 Wreckage can be found over a great distance , there is so much in fact as to be near impossible to miss. The reason for the crash is not known. 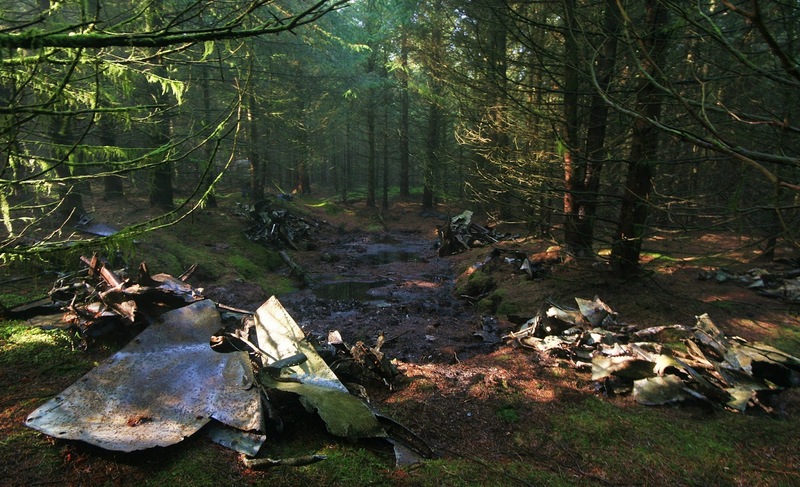 A large amount of wreckage remains scattered for some distance from the cwm . It can be seen in the stream further down the mountainside too . 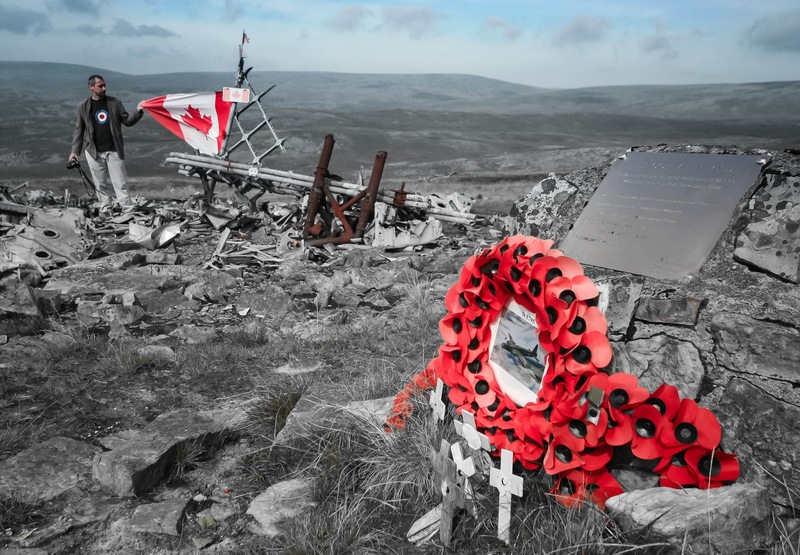 On the 8th April 1940 flying out of RAF Bicester L9039 crashed into The Carneddau mountain range in Snowdonia North Wales. 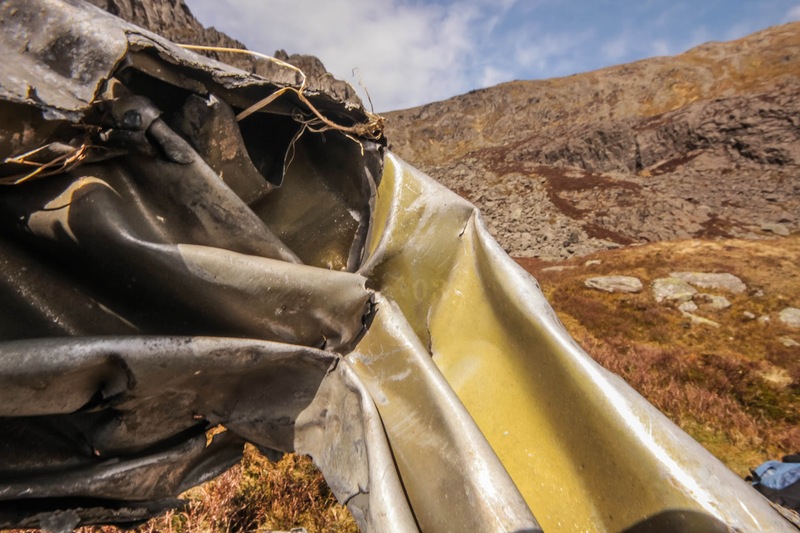 The crew of 4 were on a cross country training flight when they broke formation and crashed high on the mountain .the wreckage is strewn from the impact point down to the boggy valley floor below. On the 17th October 1942 this aircraft crashed into a grassy slope on the Carneddau mountain massif in Snowdonia North Wales. Flying out of the 418 squadron base of RAF Bradwell Bay on a cross country training flight . They entered cloud an hour into the flight and navigated using their compass and radio bearings . Unfortunately they were off course and flying at 3000 feet smashed into the mountain . A few hundred feet higher and they would have cleared it. Two of the crew died in the crash but one ,the pilot , survived with some major injuries. Sgt Sims lay close to the aircraft under an improvised shelter of wreckage for two days before being discovered. He sustained a broken leg , fractured skull, broken spine and multiple other injuries ....he also contracted gangrene whilst recovering . Despite all these injuries he eventually made a full recovery and returned to his squadron where he went on to serve with distinction, completing a full tour, shooting down german aircraft and being awarded the DFC. A hero , who had a very fortunate break in hitting the flattest grassiest part of the Carneddau. 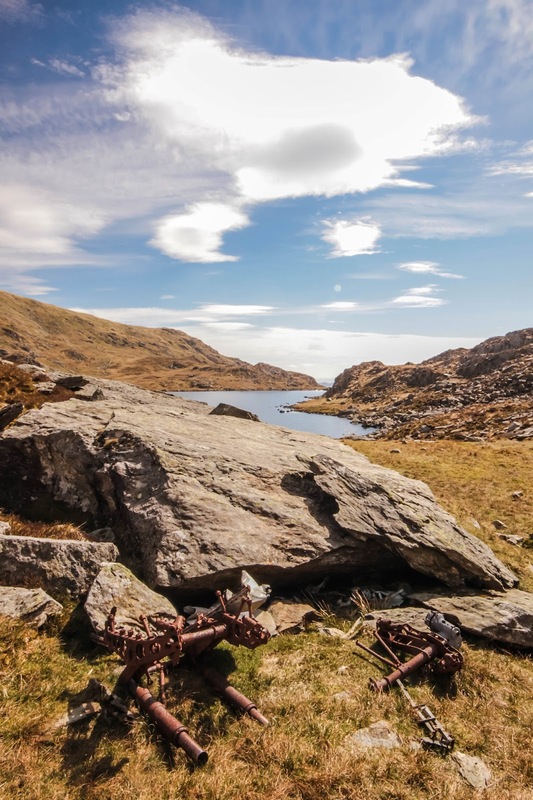 On the 15th of March 1950 whilst on a a night navigation this aircraft crashed into the scree below the Black Ladders ridge, just above the source of the stream LLafar. Witnesses saw the aircrafts navigation lights flying through cloud too low to clear the mountains , a short while later they saw a flash of flame followed by an explosion as the aircraft destructed on the rocks. All the crew were killed in the crash . The impact point is heavily scarred and evidence of burning is clear . The surrounding area is strewn with small pieces of wreckage . From the crash site and down the stream there are many larger pieces of wreckage including a wing spar that is 25 feet long . The Avro Lincoln was a develpoment of the more famous Avro Lancaster . It began life as the Lancaster Mk IV but the differences were deemed great enough to require a completely different name . The prototype first flew in 1944 but the aircraft production times resulted in the Lincoln never being used in WW2. 604 were built in total. 4 still survive to this day. It could fly higher and faster than a Lancaster , further than a Lancaster and carry a greater payload. Above shot taken from the scree where the aircraft impacted upon the mountain. On the 19th of July 1942 this Wellington bomber of No27 Operational Training Unit crashed whilst on a cross country navigation training flight into an area of the Carneddau massif called Black Ladders. 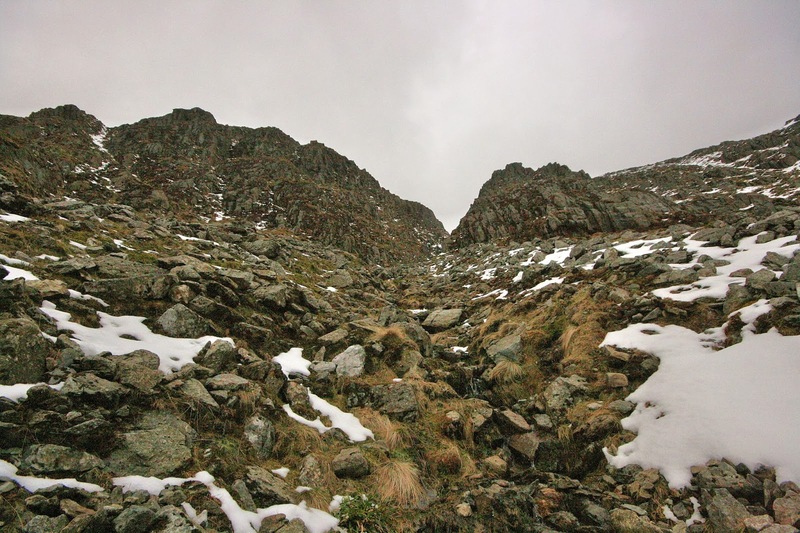 It is aptly named , a pathless route out of this dark forbidding valley to the sunlit ridge above. a few hundred feet from the ridge itself is the crash site amongst the scree . 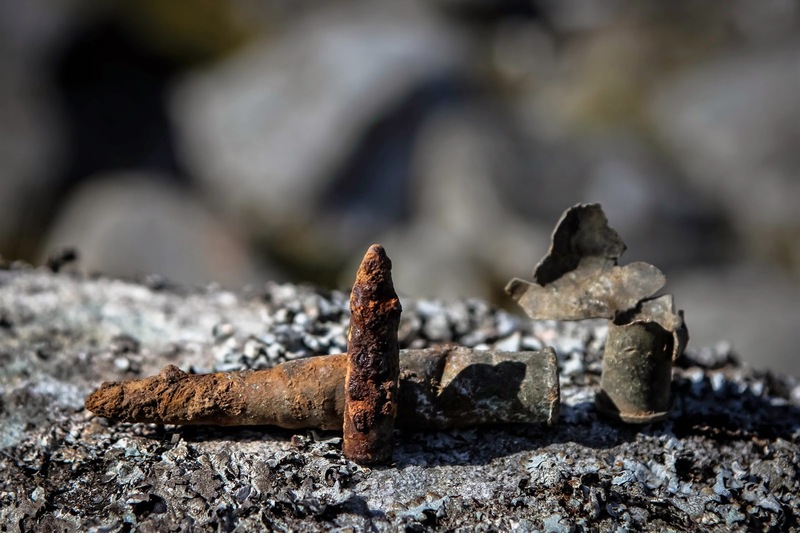 Little remains here today , just small fragments of alloy. 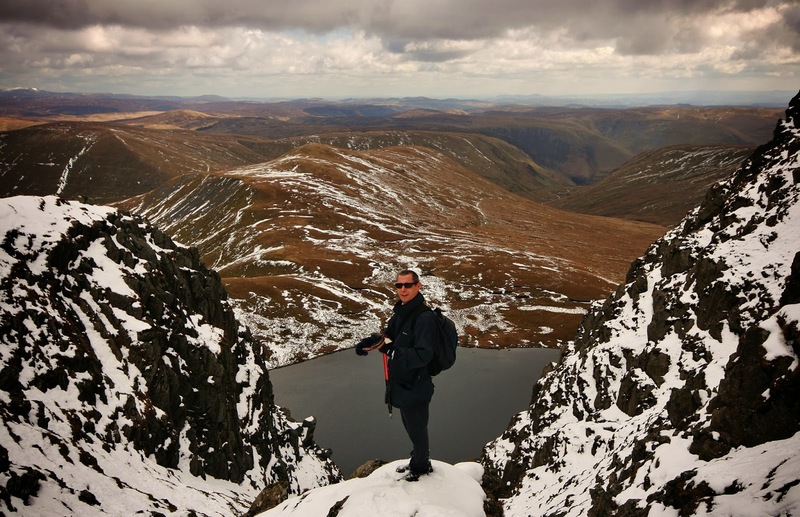 Nevertheless it is a very dramatic place with the towering cliffs of the Carneddau looming above . The crew of five were all killed. There is wreckage to be found in the stream below this site but by some reports it is not from the Wellington but from the Lincoln which crashed close by here 8 years later. 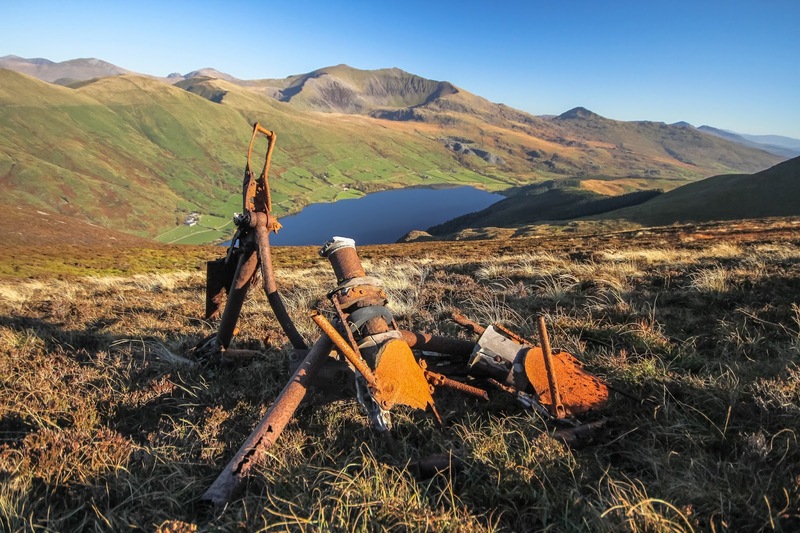 On the 8th November 1943 this aircraft flying out of RAF Halfpenny Green on a night navigation exercise crashed close to the top of Pen yr Ole Wen in Snowdonia ,North Wales . 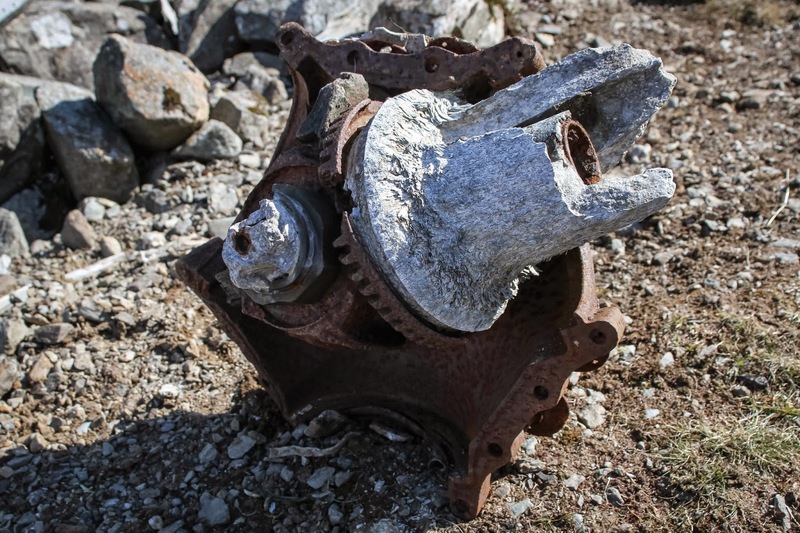 There are few small bits of wreckage to be found on the steep slopes , and trace evidence at the impact point itself . Although I only looked over the edge at it and it didnt seem worth the risk going down for a proper look. There were five crew members all of which lost their lives. The aircraft crashed into the mountain and caught fire, then dropped onto the plateau below beside the lake. Below is an exerpt from a report that can be found on Aviation Safety Network website. There are flaws the largest one being a picture of the wing from the ventura crash that is perported to be the Anson (the anson had wooden wings which by their own report were burnt).
'' During the evening of the 8th November 1943 to crew of five took off for a night navigation exercise. The route was to have covered approx. 320 miles passing over of close to the following points Base - Rhyl - Conwy - Douglas - Maughold Head - Chetton - Base. A short way into the flight the crew received a QDM from RAF Tilstock of 050 degrees with the location of the aircraft being assumed to be in the area of 4 miles NW of Shawbury roughly on course for Rhyl. 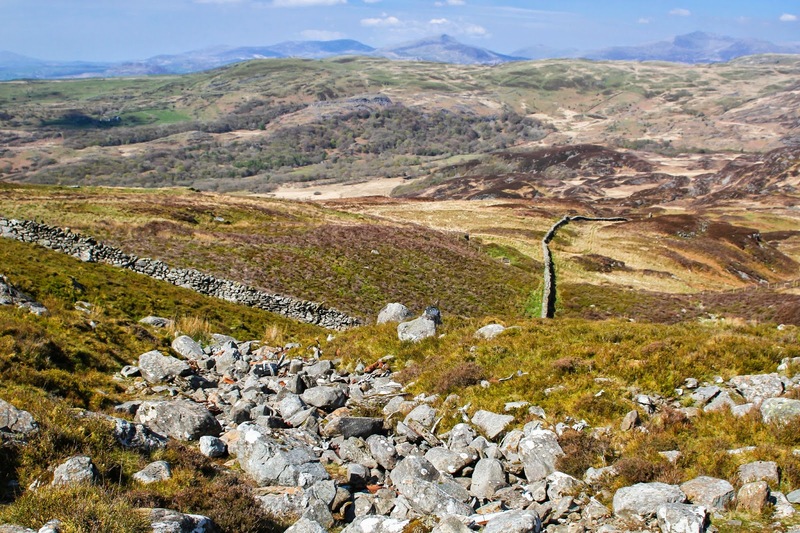 It was next plotted by the Royal Observer Corps on a route that appeared to be a direct track from Wrexham to Conwy. A direct track from the Wrexham area to Conwy would not normally have taken an aircraft into Snowdonia, but on the night there was a 15 mph wind blowing from west north west which the Court of Inquiry remarked on as "if correction for drift was not taken the aircraft would drift south of the second turning point"
There does seem to be a great deal of confusion as to which wreckage comes from what aircraft here . Definatively the undercarriage sections at the tarn side came from the Anson and panels painted yellow also came from the Anson ....but some of the wreckage contained Lockheeds factory mark so were definately from the Ventura despite reports that state only the wing was from the Ventura. 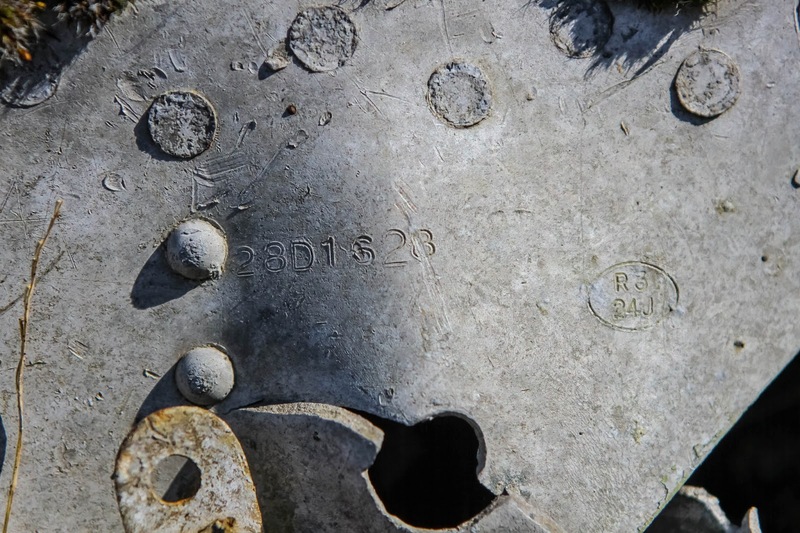 This bit could be from a number of aircraft that crashed in the locale . Propellor and hub with partial reduction gear . On wednesday the 9th February 1944 Mosquito Mk.IX LR412 of Squadron No. 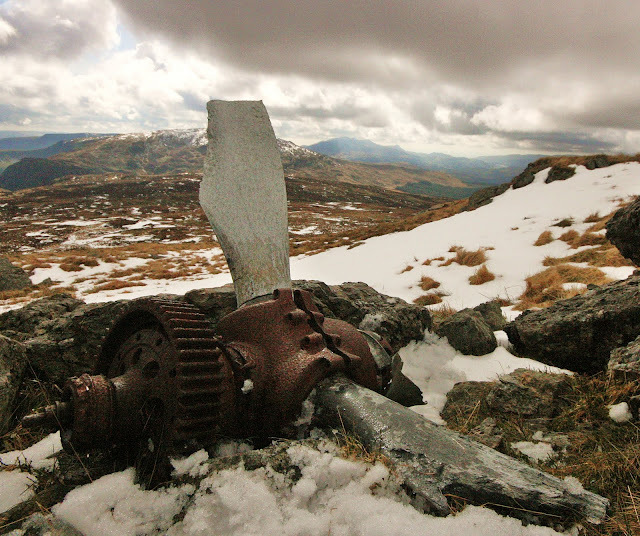 540 of the RAF, crashed onto the higher slopes of Aran Fawddwy , Snowdonia , SSW of the summit itself . Both crewmen were killed in the crash . They were flying out of RAF Benson and were testing two new flaps . Both pilot and navigator were very experienced , F/Lt Riches having been awarded the DFC in 1943. The weather was not too bad ,some cloud but not extensive . The crash does seem to have some mystery surrounding it , the propellor does not appear to have been turning on collision with the ground ,yet a Mosquito could fly comfortably on one engine . Visability was reportedly quite reasonable and both were experienced men . They are buried together at Chessington , St Mary, cemetery, Surrey. The aircraft itself had taken part in many operations over enemy territory. 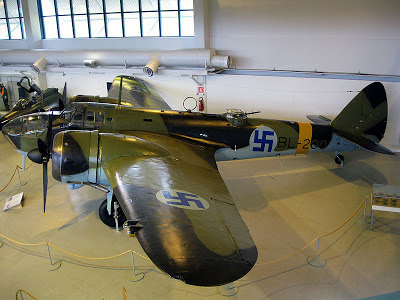 On the 23rd March 1940 Bristol Blenheim L4873 flying out of RAF Upwood on a formation flying exercise with two other Blenheims became lost in cloud . 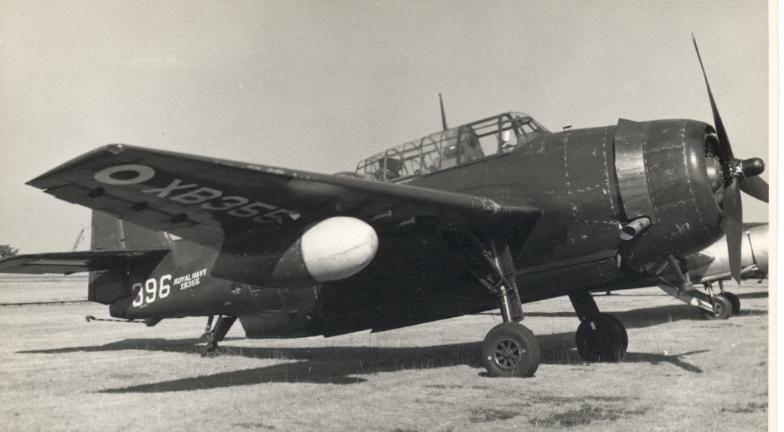 The two other aircraft found clear sky and returned to base but the pilot and crew of L4873 became increasingly disorientated in the cloud . Eventually, it is presumed, they decided to try and descend under the cloud cover to try and get a fix on thier position. 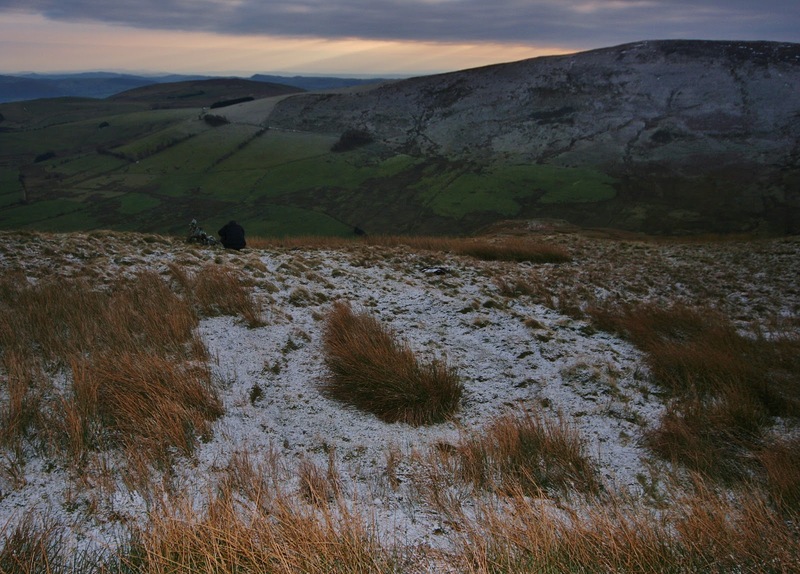 Instead of finding the cloud base they found the shoulder of Foel Wen in the Berwyn Mountains ,North Wales. 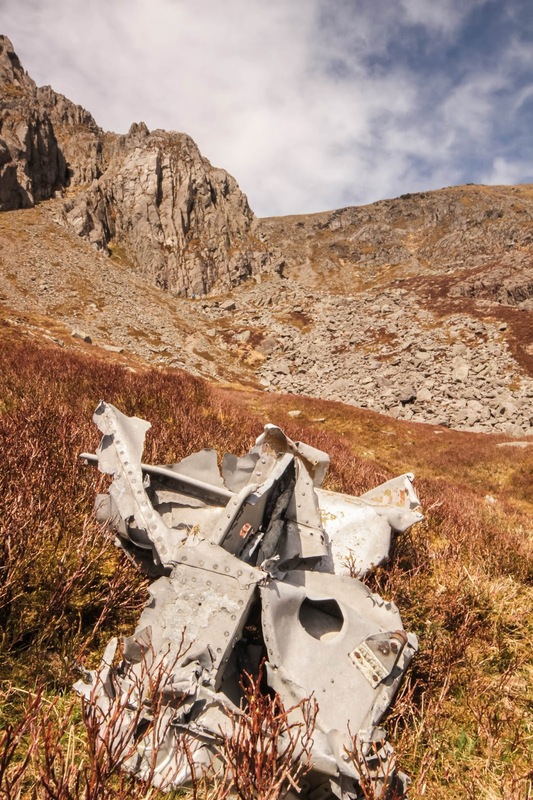 The aircraft was utterly destroyed on collision with the mountain. A teardrop shaped impact crater can still be clearly seen , its shape indicative of the angle of descent . A substantial amount of still painted (in part) aircraft fragments can be seen amongst the deep grass . Fuselage parts showing signs of impact crumpling , wing sections less damaged but now heavily corroded. 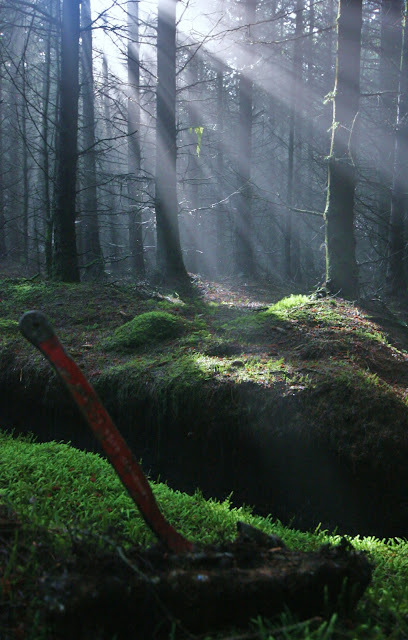 The Wales photos are superb, some great debris among stunning landscapes. Good to take a trip back through some of those places.... That Canberra site remains one of the most beautful places I've been. Almost reluctant to return because it won't be quite the same as it was the day we visited. Nice work, Paul! Only just found your blog after following a link on Ian's. Some stunning photography and interesting sites here. 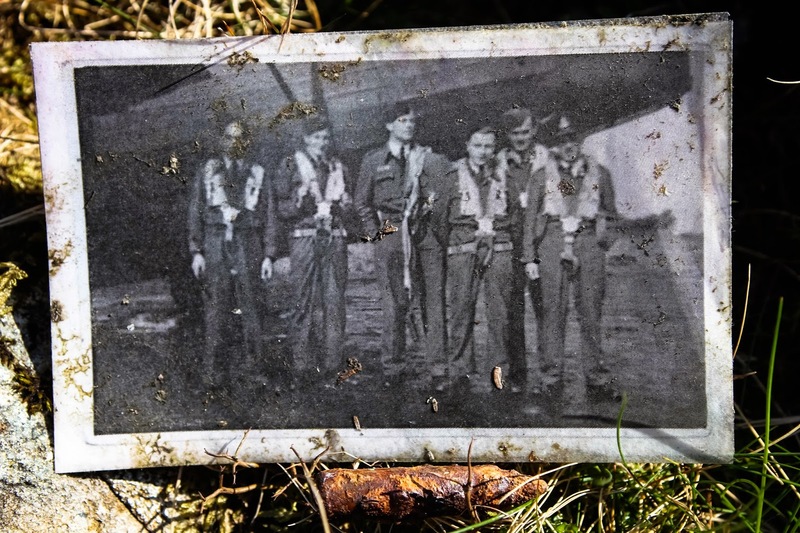 Do you have any knowledge of Wellington Z1172 which crashed in Trearddur Bay, Anglesey killing the crew of six Polish airmen? 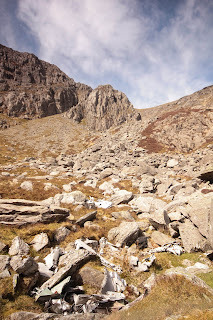 Approximately 6 years ago I was making my way up the scree slopes west of Glyder Fawr and started a conversation with an elderly gentleman. It turned out he was a bother of one of the aircrew of AVRO ANSON N9855. 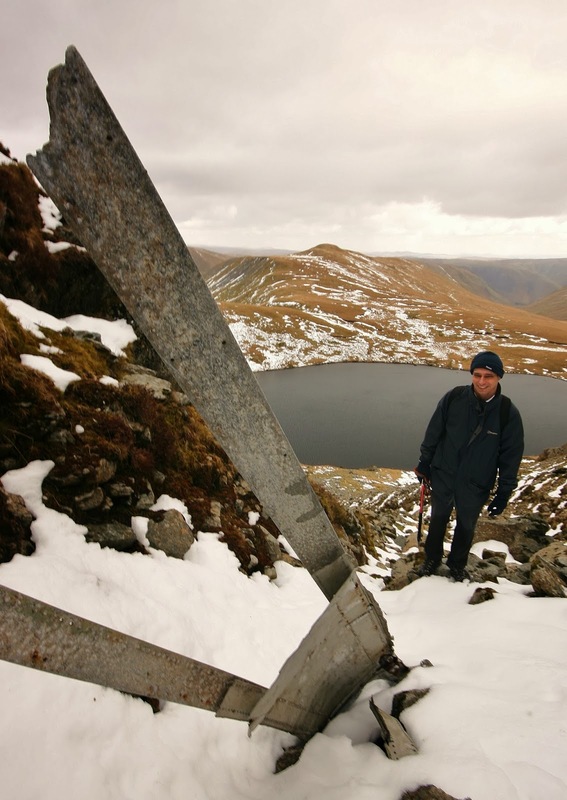 He was recovering from cancer and was hoping to make one last walk up to Cwm Lloer to place national flags at the crash site. Been to many of those sites years back...unfortunately wouldn't make it now.I nearly lost my life doing what I loved.....was very lucky. Beautiful photography, and great info. Thank You for the effort. WE WILL REMEMBER THEM. Absolutely fantastic, the pictures are stunning. You don't always realise what is on your doorstep such amazing history. If you are living near or visiting Carmarthenshire it is well worth checking out the book Carmarthenshire Air Crashes the pictures aren't as good as yours but the accounts of the crashes are fascinating. 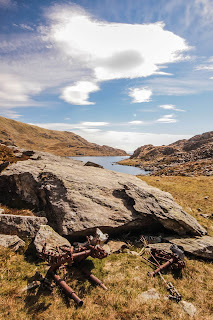 I saw the wreckage of the Anson in Cwm Lloer when I was on a mountaineering course at Ogwen Cottage in the 60's. I remember seeing part of the under carriage with the chrome plating still in excellent condition but then it was only 20 odd years after the war, I shouldn't think it's like that now. Ron James who was the head climber/teacher (?) 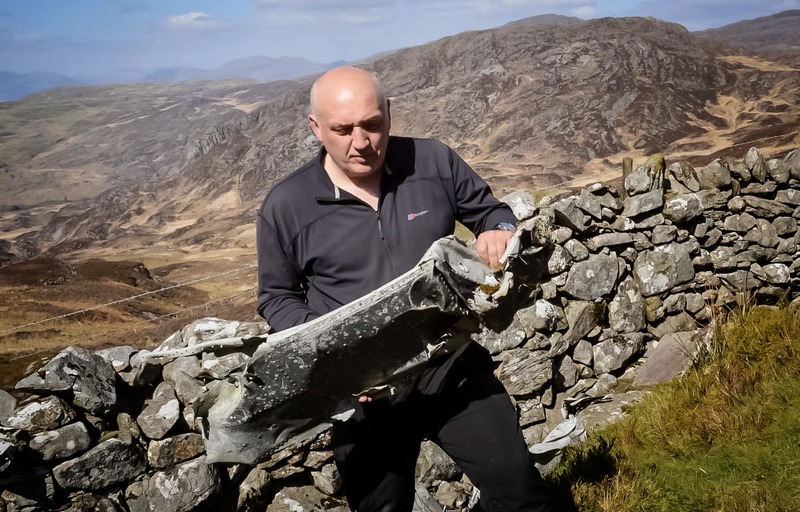 at Ogwen Cottage said there was a logbook there with records of the crash sites. Fascinating information and great photos. 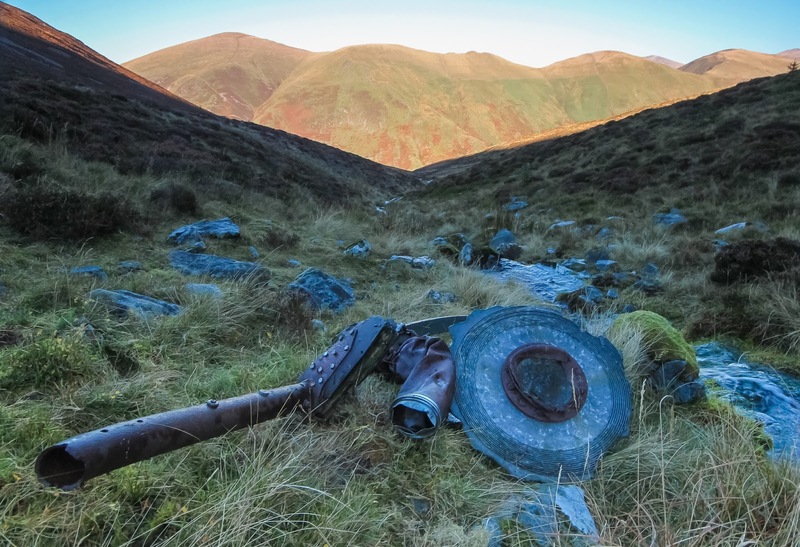 I'm interested in more detail on the Blenheim L9039, which is just listed as crashing in the Carneddau. I live in the area and the mountain the background of one shot looks like Pen Llithrig Y Wrach, which might make the crash site the back of Cefn Cyfarwydd. My grandfather during the war worked as a salvager/engineer for the RAF. After the bodies/parts were collected then my grandad and the team would go in and salvage weapons and other parts that could be re-used. I still have two old penny coins from the Wellington bomber that crashed on Carrog Goch in the Brecon Beacons, Wales that he collected. They are bent and burnt. He also kept an excape axe and made letter openers from the fuselage and canopy of other aircraft crashes. Not sure if they are bad luck and what to do with them. Bill my dad said was mortified when he lifted some part of the aircraft and one of the Canadians crews testicles was under it that was missed. Post shots of your own crash site visits ! but all are welcome ! The crash sites are divided into areas . Each post can be found individually if you enter the aircrafts type and code into the search box......if you know what that is of course.....if not, click the area of the crash and scroll down to see if yours is there .